Readers who are still wondering how to celebrate the 2000th anniversary of the death of Publius Ovidius Naso could do worse than to visit Waddesdon; a 'French chateau' built by Ferdinand de Rothschild to house his immense collection of Bourbon French goodies. And, surely, Ovid, with his love of the intricate joke, his frivolity, his sensuality, was the presiding numen of the arts and crafts of Bourbon France. So what fun Waddesdon is; as good as the Wallace Collection or the Burrell (my favourite venue in my favourite Scottish city). Better than those, if you include the fountains, reconstructed after being bought from the duke of Parma [was it the Duke of Parma who congratulated Archbishop Lefebvre after the Econe Consecrations?]. What superb taste Baron Ferdinand had. The Spirit of Ovid lives; long live the Spirit of Ovid. I feel more at home there than among the heavy splendours of nearby Blenheim, a monument to the career Johnny Churchill secured by his treachery to James II, and now cluttered up with memorabilia of some Brit politician who allied himself with Uncle Joe Stalin during some war we fought in the last century. If I have to choose between Jewish bankers and the traitorous clique that kept the Head of the House of Stuart off the throne, then give me the Jewish bankers any day of the week. The only feature of a genuine French chateau of the seventeenth century which is missing at Waddesdon may be ... er ... the chapel ... Curiously, Baron Ferdinand did collect quite a bit of 'Christian' stuff, but he never provided it with a proper setting; so most of it is propped up on window sills in the Bachelors' Wing. Were Edwardian bachelors always Christians? There is a chapel at Blenheim, but it is never clear to me who or what is supposed to be worshipped there. Most of it is cluttered up with some great thing Rysbrack cobbled together in honour of ... Johnny Churchill. When we went there with some friends last year, the Altar was completely hidden by a plaster statue of a naked female, buttocks angled towards the viewer. If I have to choose between Judaism and Agalmatophilia, then give me Judaism any day of the week. At least Judaism doesn't, so to speak, force proctophilia down your throat. Please don't write angry letters ... this is meant in a Spirit of Frivolity ... in honour of Publius Ovidius Naso, who has been one of my dearest friends for decades now. Salve, Magister. In previous pontificates, prelates wearing a pectoral cross with their 'house clothes' used to suspend it from a dinky little hook which was inserted into one of the button-holes in the middle of the chest of their soutane. There was a chain round the neck, but what actually supported the cross, as well as keeping it in place, was the hook. That, at least, is my recollection. Nowadays, photographs of prelates seem always to show the cross as simply dangling from the chain. This is our beloved Holy Father's own practice. Is the prevalence of this new custom since 2013 analogous to the cultural tendency which led to so many German males wearing neatly trimmed little moustaches during the Hitler years? Is there some connection with the fact that so many aged Italians, born in the 1930s, bear the name 'Benito'? I intend to begin a rumour that the Sovereign Pontiff has started wearing a nose-ring, so as to see how long it is before nose-rings peep delightfully out of the elegant nostrils of our Most Eminent, Most Reverend, and Right Reverend Fathers in God. The English novelist and Catholic convert Evelyn Waugh (he went to school in the college I taught at for three decades and then to my College at Oxford) began the Second World War enthusiastically in favour of a Crusade against the Russian-German Alliance. Now, spendidly, everything had become clear. The enemy at last was plain in view, huge and hateful, all disguise cast off. It was the Modern Age in arms. When this conflict turned into a war in which Britain was in alliance with Stalinist Atheism, he felt it had become a sweaty tug of war between two indistinguishable teams of louts. Only the chill bonds of law and duty and custom kept him to his obligations as an army Officer. I wonder how Catholic historians in a hundred years time will analyse the role of the Second World War in the decline of what I believe some ghastly neocon once called old Europe: the Catholic and Orthodox Europe. Is this intimidation fair? Is it Christian or Diabolical? There was an early stage in this pontificate when the Holy Father was convinced that all good men and true knew, deep down, that the Church's marriage discipline needed changing. All that was needed was for the Synod Fathers to speak boldly the Bergoglian Truth that was really in all their hearts. During this period, Papa Bergoglio made incessant calls for Parrhesia: for courageous boldness in speaking out. This was the period in which his friend and ghostwriter 'Tucho' Fernandez was memorably heard to say "He means, Mueller [then Prefect of the CDF] won't come after us". Mind you, some of Bergoglio's highly-placed supporters knew that the Spirit of Parrhesia was going to be needing a bit of a helping hand, in the shape of deft and careful management of process. Someone in the upper reaches of the Catholic Church in England and Wales, on hearing that some 450 of the English clergy were preparing to sign a public Letter calling for adherence to orthodoxy and orthopraxis, put a lot of pressure on the organisers to discontinue their project. Or so the Catholic Herald reported. The line was: there were perfectly adequate private channels for the clergy to make their views privately known to ... their, er, bishops. Exactly. Beautiful. That dodge is neatly laid out on page 665 of the much-thumbed manual How to be a successful Church Manager. Happily, and bravely, the organisers ignored the pressures. Then we had the Letter of the 45. This was followed by deplorable episodes of intimidation, some of it immensely cruel and very wicked, in various parts of the world. You will understand that I cannot break confidences by saying who leaned on whom and how. But I assure you that Bully A did lean on Intermediate Bullies B and C to put their gloves on and to go and sort out D and E.
And now, as I write this in August 2017, similar episodes of intimidation are coming to light. Whatever has happened to all the need for Parrhesia? Why has that word suddenly done a runner from the Papal Vocabulary? Has Bergoglio suddenly forgotten his Greek? Again, for an answer you need only turn to How to be a successful Church Manager, this time to page 666: "Shut the inferior clergy up until you've fixed your Synods and confected your post-synodal Exhortations, then use the big stick of Papal Magisterium to keep them permanently quiet. Most of them are a pretty scared and pathetic lot anyway, and you'll only need to make a public example of a few of the louder troublemakers. Don't forget to make clear to any seminarians you may have, that the seminary gates are wide open. And there is never any harm in allowing the sweet fragrance of the words Excommunication and Suspension to linger suggestively in the air. Our Father Below is very keen on rigorous ecclesiastical discipline." Like Parrhesia, Mercy is now so very Yesterday, isn't it? For the next fortnight, I shall not be reading in-coming messages on my computer. But, all being well, I shall publish a post every morning. Comments will have to await moderation, and emails will be unread, for the next couple of weeks. I venture to commend to readers the advantages of not being at the mercy of in-coming traffic, and all its distractions. According to AL, a conscience may "recognize that a a given situation does not correspond objectively to the demands of the Gospel" but sees "with a certain moral security ... what for now is the most generous response". Let us examine how this moral principle might apply in situations of organised and industrialised genocide. A man involved in the extermination of Jewry, for example ... if he were to decline to collaborate in any more murders, not only might he be subjected to discriminatory responses, but his family also might suffer grievously. His marriage might suffer! Is he, perhaps, required by the Bergoglian moral principle of "what is for now the most generous response" to try, gradually so as not to be noticed, to reduce the number of Jews whom he kills each day? Or might Bergoglianism mean that he should do his very best to see that they die less painfully? Or should he attempt, again without drawing too much attention to himself, so to work the system that in three months time he gets transferred to duties which involve him less directly in extermination ... like, for example, harmlessly organising the train schedules? I am aware that my questions lay me wide open to an accusation that I am either an unbalanced crank in making an equivalence between well-mannered habitual adultery among the nice, if rather gleefully rutting, German middle-classes, and genocide; or 'antisemitic' for illustrating a moral priple by talking so calmy about something as vile as what Nazi Germany did to the Jews. It is my view that such an accusation by such an interlocutor would in fact amount to an admission that Adultery is not really sinful ... that it is, well, perhaps not technically in accordance, quite, with the book of rules, but it is not really wrong. Cardinal Coccopalmerio has in fact said something rather like this. It is also my view that a mortal sin is a mortal sin is a mortal sin is a mortal sin. And Mortal Sin is the area into which, like several fair-sized and unstable bulls in a very tiny china shop, Bergoglio and his cronies have strayed. And by sanctioning what Fr Aidan Nichols has neatly called "tolerated concubinage", I do not think they will bring a single murdered Jew back to life or even save a single victim in future genocides. In fact, quite the contrary. Do we save lives ... or marriages ... by chipping away at the Decalogue, or by shoring it up when it comes under threat? A person, you tell me, may well know a rule yet be in a concrete situation which does not allow him or her to act differently. So .... if this does not also apply within genocidal situations, where can it apply? A person's long involvement, you tell me, in sinful actions may well so habituate him to those actions that the subjective sinfulness, as AL claims, is radically diminished ... yes; I happen to agree with you there, and, like all confessors, I am mindful of this when I sit with my ear against the grill. But you won't forget, will you, that somebody who has been killing Jews for a couple of years might also well be in such a condition. And the tribunals which judged War Criminals after 1945 don't seem to have taken this laudable casuistic principle into their jurisprudence. Bergoglio's 'jesuitical' campaign to circumvent Veritatis splendor paragraph 80, as well as Familiaris consortio, is both a moral and an ecclesial disaster. If Bergoglian 'moral principles' prevail, then, as Fr Aidan Nichols has accurately put it, "no area of Christian morality can remain unscathed". ... the Virgin is Lady according to her worthiness, as being Mistress of all, since it was in virginity that she conceives and divinely gives birth to the One who by nature is Master of All. And of course she is still Lady as not only free from slavery, and possessed of divine lordship, but also as fount and root of the freedom of the race, and especially after the ineffable and joyful childbearing; for the woman who is yoked to a man is lorded rather than lady, and especially after after her sorrowful and painful childbearing according to the curse made against Eve ... the Virginmother, freeing the human race from this curse, receives joy and blessing from the angel; for he comes in and says: 'Hail Graced One, the Lord is with you, you are blessed among women'. The archangel is not proclaiming the future in saying 'The Lord is with you', but announcing what unseeing he sees at this very moment fulfilled. And knowing her to be the place of divine and human charisms, and adorned with all the charisms of the divine Spirit, truly he proclaims her Graced. A little gem for you from the great and untranslatable hesychast father S Gregory Palamas. Sometimes I fantasise about the ecumenical day when Rome might feel able to add him to the Calendare Romanum Generale and to proclaim him a Doctor of the Church. By the way, today, old Octave Day of the Assumption, is regarded by Dom Gueranger as quintessentially the day when we think of the Mother of God as Queen; among other quotations from the great masters of Christian spirituality, he gives us the passage from S Bernardine of Sienna which so enrages Marian minimalists: that even God obeys Mary. The post-Conciliar placing of Maria Regina on this day makes more obvious sense than the (Pius XII) Feast of her Immaculate Heart. Let nobody accuse me of being an unthinking critic of all post-Conciliar liturgical ideas. Although the Feast of the Immaculate Heart does bear with it notions of Divine Victory: her Immaculate Heart will triumph. Today Blessed John Henry Newman began the wearing of the Miraculous Medal. And, centuries before, one of England's greatest bishops, John Grandisson of Exeter, chose to be enthroned this day and to order our Lady's Octave Day to be kept henceforth for ever as a feast of the highest rank. Furthermore, even though it was not the day of his death, he disposed that tomorrow be kept as his obit. I am sure that all right-thinking clerics will wish to remember him at Mass tomorrow. Grandisson was a Sound Bloke. Friend and protege of John XXII, he reacted to the threat of a Metropolitan Visitation by having the Archbishop of Canterbury repelled by his private army. Let nobody slander the Avignon Papacy in my hearing. A very Anglican Patrimony Day. Perhaps the Ordinariate should bring in the cause for Grandisson's Beatification, as well as including the Miraculous Medal in our Mission Statement. Mr Austin Ivereigh thinks that we converts should be quietly humble. We should remember that we can never have the same pure, balanced and holistic understanding of the Faith that he and his fellow cradle Catholics have. Well, I'm not going to criticise him, because I find him rather scary. He got money from the Daily Mail some years ago because they, as the Jury in the Libel Court unanimously decided, grossly misrepresented some episodes in his earlier life. I don't like the Mail ... it seems to me a nasty little paper ... so good luck to anyone who can do them for libel ... but I've no desire to have to fish my own cheque book out for anybody. So ... forelock duly tugged ... deference elaborately exhibited ... yes, Squire, no Squire ... whatever you say, Mr Ivereigh. And I expect you are even crosser with us converts, now that yet another of our number, the iniquitous Fr Aidan Nichols, has just had the temerity to suggest that there is a crisis in the Roman Magisterium and that there ought to be means of canonical redress for people who think an occupant of the Roman See should be held accountable for heterodoxy. That's just the sort of thing some convert, who wastes his time going around lecturing and writing a couple of books a year about Catholic doctrine and history, would say, isn't it ? I'm with you, Austin, all the way. Good On Yer Cobber, as they reportedly say in Oz. So, instead, I'll turn my spotlight on an American who is a convert himself. David Mills humbly confesses that we converts will indeed always be creatures inferior to genuine, encradled, Catholics. And Mr Mills appears to demonstrate something even worse: that since he entered the Catholic Church, his understanding of Catholic doctrine has deteriorated. Two examples: (1) he appears to think of our blessed Lady as a sort of vessel which contained the Incarnate Word. Rather off-centre: the Lord took his human substance of the Virgin Mary His Mother (as the Christmas Preface in the Anglican Use makes clear); he did not merely pass through her as water does through a pipe, or as the Lord's Blood is contained in a chalice. And (2): he calls the Church "a living body moving through History" ... which is jejune. The Church is the Body and Bride of Christ. The Church Triumphant (our Lady and all the glorified Saints) and the Church Expectant (the souls whom we remember before the Father) are not within History in any natural sense of that phrase. Only the Church Militant could be described in the way David Mills does. The habit of regarding "the Church" as synonymous with the Church Militant here in Earth is a common mistake among Roman Catholic theologians as well as 'ordinary' Catholics. Those of us from the Anglican Patrimony have had the opportunity of being taught (for example, by the great Eric Mascall) that the Church is something immeasurably greater than merely the Church Militant. In the words of another mighty Anglican writer, C S Lewis, she is "spread out through all time and space and rooted in eternity, terrible as an army with banners". I suspect that this much healthier and more balanced understanding of "Church" may owe something to the influence which some Orthodox writers had on Anglican Catholics such as Mascall in the twentieth century. However that may be, we see the wisdom of Pope Benedict XVI in calling us corporately into the Catholic Unity and urging us to hold fast to the riches which are legitimately ours. I for one have no intention of asking Mr Mills to share his sackcloth with me or to spare me some of his ashes. In the passage by the Dining Room of the Clergy House attached to S James, Spanish Place, I noticed an engraving of a prelate carying the Blessed Sacrament in a monstrance. I think the engraving had a date around 1792. The prelate was wearing a wig. Changing the subject ... readers will have seen the splendid picture on Fr Tim's blog some time ago of the admirable Bishop Richard Challoner wearing his wig and blue choir dress. French and Irish bishops also wore blue ... illuminating comments?? A sign of Gallicanism? When did it cease? We poor converts need all the help we can get in our struggle to become genuinely inculturated. Good to see Fr Tim blogging again. Like all good Catholics, I check his blog daily. Hmmmmph. A Problem. Some time ago I ran into a friend I had not seem for some time. In the course of conversation, he communicated to me the information that the Conclave for the election of the next Pope will take place in October. He was taciturn, but confident, about his sources. Well, there you go. My own instinct had been that the present occupant of the Roman See would carry on as long as he could, so as to make his own particular agenda even more rigidly safe, and to make yet more of his wise appointments. So, in an unwise moment, I advanced a reckless wager that my friend was wrong. Now I've got Cold Feet. Suppose my friend knows something I don't know ... What will he say when my cheque bounces? Dear Readers, I desperately need the current pontificate to carry on at least until the early hours of All Saints' Day, Greenwich Mean Time. I look to everyone to do anything they can to ensure this. It would be great if learned readers were able to look through the now enabled comments of the period 6 August to 17 August, and turn up one or two answers. I do apologise to readers, who do me the kindness of reading this blog, and have thought me discourteous over these few days. I think I have been. ... does not, of course, exist, either in the OF calendar or in the (already heavily reformed) books of 1962. Except vestigially; the old Octave Day was made the Feast of our Lady's Immaculate Heart in 1944 by Pope Pius XII. One of the changes made in the post-Conciliar Calendar which I find very attractive is the movement of the Feast of our Lady, Queen, originally placed on May 31 by Pius XII in 1955, to this slot. The reasons for associating this observance with the Assumption cycle are too obvious to need spelling out. The great fourteenth bishop of Exeter John de Grandisson (whom old lags in the reading of this blog will remember I have mentioned several times) arranged to have his enthronement on August 22 and (although it was not the anniversary of his death) to have his obit kept on the day following (is such a practice common?). Naturally; he was a devoted client of our Lady, particularly under the title of Mater Misericordiae, and his devotion seems to have been very much along the lines of that recommended by S Louis Grignion de Montfort. I suppose an unofficial repetition of the Assumption Mass on the days within the Octave is contrary to current rules both in OF and EF; votive masses of events in the life of our Lord and his Mother are, with the exception of the Immaculate Conception, not allowed. One could, however, say ordinary votives of our Lady. I would like to see restored, as an optional Votive, the old Gaudeamus mass of the Assumption, the one superseded in 1950. It makes an important point about the Assumption: that we ought to see that mystery in terms of our Lady's mediatorial role. The Collect: it is Mary's intercession we need to be saved; the Secret: she has migrated so that we may sense her intercession in heavenly glory; the Postcommunion: it is by her intercession that we pray to be delivered a cunctis malis imminentibus. Here is a piece I originally wrote when I was still pp at S Thomas's. I added the last bit in early February after being sent a link to Emily Clarke's unbelievable ditty. I include also some of the original thread. When I took over the Church of Sancti Thomae Martyris iuxta Ferriviam Oxoniensium, I found a lovely pile of small green hymn books, apparently dating from the 1930s, in a cobwebby cupboard. The English Catholic Hymn Book is full of absolute gems, recalling the triumphalist Anglo-Catholicism of the Age of Martin Travers. The numbers start at 800, so as to render it practicable to use it together with the English Hymnal. 936 begins 'The happy birds Te Deum sing,/'tis Mary's month of May./Her smile turns winter into spring,/ And darkness into day' (Alfred Gurney, I think). It goes nicely to the tune of 'O little town of Bethlehem'. Then there's 928, 'O Mother! will it always be,/That every passing year,/ Shall make thee seem more beautiful,/ Shall make thee seem more dear'. That, of course - no prizes - just has to be by the greatest of the Romantic poets, Fr Faber. How could the tedious Mr Wordsworth possibly compare with him? I used it at S Thomas's to the tune of 'It came upon the midnight clear'. We were once visited (anonymously) at S Thomas's by a chap writing reviews of churches (he wrote in his report of us that he would have given my homily 9/10 had I not ended with a ringing account of the Battle of Lepanto which, he thought, reduced it to a 5/10). He was scathing about the singing of 'I'll sing a hymn to Mary' to the tune of the Eton Boating Song ... a marvellous idea which I had picked up from the late, mighty Fr Melrose of S Giles in Reading (whom I think of every time I take up my beautifully printed 1940s Breviarium Romanum to say my Office, or one of my sticks to go for a walk .... all formerly his). But ... great heavens ... this is just the sort of plundering-for-God, robbing the Devil of his best tunes, that Faber, and the Wesleys, performed. It is the New Evangelism at its most joyous. YAROOH!! Since I wrote all that, I have (4 Feb 2017) been directed to a four-minute Youtube clip showing some elderly chanteuse in a very obviously Irish church, singing an extremely sickly song actually invoking our dear Holy Father! As if he were a numen or ad minimum one of the mighty ones in the militia caelestis exercitus! At least Nicolas Wiseman didn't invoke Pio Nono!! Or is the song a coded cry for Santo subito? It includes lots of shots of pictures of the Sovereign Pontiff exposed in the church for veneration and framed for the camera by candles. And the poor chap isn't even dead yet! The lady seems to have changed her dress after every few words of her ditty, so I presume an original full, unexpurgated fifty-minute video must somwhere exist showing her multiple strip-teases.This blog will preserve her aged modesty by not providing a link. The full breadth and depth of Bergoglianism and its sugary personality cult continue to disclose themselves!! Medieval calendars quite often inform us that the Sun is in the constellation Virgo on August 15. I wonder if it has ever been suggested that this astronomical fact has anything to do with the selection of that day to celebrate our Lady's Assumption. Which Collect is preferable on August 15? Certainly not an Anglican one: they all seem rather sad examples of modern Anglican collect writing: a couple of wordy banalities shoved together, and all the time a sense that the writer is looking over his shoulder fearing that he might be deemed too "extreme". The Pius XII composition is preferable ... but I'm not over-enthusiastic about it quite simply because one of the older collects it replaced is, in my view, quite exquisite. I don't see how anybody whose affections are excited by the old collect Veneranda, and by the teaching of S John Damascene, and the explicitness of the Byzantine Liturgy about the glorification of Mary's wholeness, can dislike the Pius XII collect for doctrinal reasons. But minimally conceived 'doctrine' does not exhaust the content of 'Tradition'. My own hesitations about features the 1950 definition relate not to what it said, to which I of course very cheerfully subscribe ex animo, but (1) to what, by not saying, it appeared to imply could be forgotten - such as the edifying common legends which informed piety and art in East and West for centuries and about which Blessed John Henry Newman spoke so sympathetically; and (2) to the fact of our Lady's mediation of all graces. This was clearer in the older traditions of East and West, but in the West has more recently been overshadowed by preoccupation with the idea, true in itself, that the Assumption is the logical consequence of her preservation from all sin. Mary, in History, mediated all graces to humankind by giving birth to the Redeemer; her Assumption means that what she was in History she is ontologically and for all eternity. In her, function and ontology are fused into one. I would feel more cheerful about the 1951 liturgical texts if they could be supplemented by a definition of our Lady as Mediatrix of All Graces. It could be phrased in the elegant Greek with which S Gregory Palamas explained this truth! Pius XII, for all his Marian devotion, was opposed to the concept of our Lady's Universal Mediation. Now is the time for Pope Francis to recalibrate the balance! Sunday 28 August He walked thro the City (the Mayor, bareheaded carrying the Sword before him) to the Castle and heard Mass in the Shire Hall. He went into the choir of the Cathedral at nine o'clock where he healed 350 persons. After which he went to his devotions in the Shire Hall, and Mr Penn held forth in the Tennis Court, and I preached in the Cathedral. His Majesty left the following day for the great and royal Catholic shrine at Holywell to pray for the birth of an heir. He was presented with the shift which his great-grandmother Mary Queen of Scots wore when she was beheaded. He was, indeed, granted an heir: our late Sovereign liege Lord King James VIII and III. I presume 'healed' means that he touched for the King's Evil. Bishop Cartwright was one of those Anglican bishops who supported the King's principled desire to allow Toleration to all, Papists, Anglicans, Quakers, and the rest. He published the Declaration of Indulgence, was one of the Commissioners for the reform of Magdalen College; and, after the Dutch Invasion, followed the King into exile. He died in Dublin in 1689. I presume Mr Penn was that same Quaker William Penn who had dealings in North America and who accepted as sincere the King's policy of religious toleration. The visit to Chester must have been one of those truly 'ecumenical' occasions which happened in England during this reign, before the Great Treachery of 1688 put a stop to them. It is surprising how little we hear about this particular little corner of History. It must have been a schoolmaster that wrote the Quicunque vult. A parson couldn't have written it; parsons address their docile congregations Sunday by Sunday and are often complimented and sometimes disagreed with: each of these phenomena conceals the brutal fact that they aren't actually understood. It is the schoolmaster who endures the painful learning experience: the students leave his study or seminar room; he is happy in the sure and certain knowledge that he has just had one of the best, most learned, most interesting teaching sessions of his life ... and he discovers, when he reads the essays or marks the examination scripts, that the group falls into two groups: two thirds of them, who clearly hadn't the faintest idea what he was talking about; and the other third, who did understand, but have forgotten it three weeks later. Or do I mean one week? The parson feels the need to make sure he never bores the folk, so he never says the same thing twice. If you preach what is essentially the same message ... just dressed up a bit differently or put the other way round ... clearly they will notice your repetitiousness. So you don't do that. And this means that the poor people never get anything straight. Because with humans you just have to lay it out as simply as possible, elementary stage following elementary stage, and then just keep repeating it. Drip drip drip. And a few years later, just a few might start to grasp a bit of it. This is the truth that teachers find out very fast and preachers rarely do. Cranmer may, as a good Protestant, have disapproved in principle of 'vain repetitions' but he had a dash of the schoolmaster about him. He understood drip drip drip. Not so Bugnini. So Cranmer ordered that the 'Athanasian' [it wasn't actually written by S Athanasius] Creed should be used once a month, but Bugnini, blindly and mechanically following the suggestion of the Council that repetitions should be reduced, expunged it from its last toe-hold in the Liturgy of the RC Church. Just try reading it. You'll find it on Trinity Sunday in the 1962 Breviary, but before Pius XII started meddling, it was said on every Sunday where the liturgy was not lengthened by a Commemoration. In the Church of England, it was ordered to be said twelve times a year. It is printed after Evensong in the Prayer Book. "Such as the Father is, such is the Son, and such is the Holy Ghost. The Father uncreate, the Son uncreate, and the Holy Ghost uncreate. The Father incomprehensible, the Son incomprehensible, the Holy Ghost incomprehensible. The Father eternal, the Son eternal, and the Holy Ghost eternal. And yet there are not three eternals, but one eternal. And also there are not three incomprehensibles, nor three uncreated, but one uncreated and one incomprehensible. So likewise the Father is Almighty, the Son Almighty, and the Holy Ghost Almighty. And yet there are not ..." Yes; even Bloggs Minimus, your most gamma minus student, will be starting to get the point. Drip drip drip. 'It's unsophisticated. People won't put up with being condescended to in this patronising way'. You can perfectly understand why the Modern Parson, and the Modern Liturgist, heave a sigh of relief as they shovel Quicunque vult into their rubbish bins; something that Pusey and Newman, Aquinas and Benedict XIV weren't ashamed to recite prayerfully and humbly as they said their office. It is my impression that most modern clergy are either Unitarians or Modalists, and (what is worse) they are so unwholesomely pleased with themselves about it. The omission of QV from the Office of the clergy, for nearly two generations now is, in my view, one of the main causes of the de facto total disintegration of Trinitarian belief in Western Christendom. We've lost that Threefold drip drip drip. But there is another such loss: the use of the Preface of the Holy Trinity on most Sundays of the year ... the Green Sundays, Advent, and the Gesimas . Of course, when one uses repeatedly a liturgical formula, one does not think profoundly about the fulness of the sense of each phrase every time one says it. But ... drip drip drip ... it becomes part of you. Drip drip drip. Continued from the previous two posts. The Blessed Sacrament, as the Body, not of the dead but of the living Christ, became a focus for devotion, not surprisingly, around the same time as personal devotion to Jesus became common; the revolution by which public liturgical prayer in the Latin Church continued, in the classical formulae, to be to the Father through the Son, but was accompanied by a vivid devotion of the individual directly to the Son. This is also the age in which the Elevation of the Host began its rise to the status it possessed at the end of the middle ages as the principal focus of lay devotion. And this was the age when some fashionable cosmopolitan intellectuals apparently started to view with disdain a number of features in the inherited cult of relics. The massively wealthy Avignon nominee to the See of Exeter in the 1320s, John Grandisson, appears to have suppressed there an embarrassingly crude popular hymn which was sung annually at the Exeter Procession of Relics. And in the vast lists of benefactions which he made to his Cathedral and to his collegiate foundation at Ottery and to the beneficiaries of his will, I have found not one single mention of even one single relic. But he possessed and donated monstrances of fabulous wealth and beauty; he ordered that country parsons should bear the Sacrament to the sick with proper dignity and not just carry It any old how. I have no doubt that his instinct was: relics are all very well, but the Sacrament is the living Body of our Maker and Redeemer. Grandisson was the protege of the (undervalued) pope to whom, under God, we owe the Feast of Corpus Christi and the immense devotional riches, for Latin Christians, of the Cultus of the Blessed Sacrament. We are often told that this all started with the bull Transiturus in 1264. Forget it! That 'legislation' had not, as far as can be discerned, been followed* even in the papal chapel itself. But Transiturus was repromulgated probably* at the council Vienne in 1311 and then incorporated in the collection of decretals called the Clementines which was changed and corrected by Pope John XXII. He, in 1317, sent it to the universal Latin hierarchy, and set an example himself by instituting Corpus Christi processions (which had not in fact been envisaged in Transiturus). His initiative spread like wildfire. Nobody quite knew how to do these new things; in 1320 a Council at Sens naively gave up the attempt to legislate for appropriate ceremonial and left the arrangement of this "apparently divinely inspired innovation" to the devotion of clergy and laity. It was clearly a devotional initiative whose day had come. We Latins can be modestly proud that it was through us that the Lord showed the richness of this wonderful treasure. This series is now completed. * In those days before printing, there is nothing very remarkable about a papal liturgical initiative directed at the Universal Church being pretty well universally ignored. Nor - although this will surprise and disquiet superconciliarists of all sorts - is there anything strange in the fact that we are far from sure exactly what happened at several ecumenical councils, including Vienne. Ecumenical Councils, as Joseph Ratzinger rather liked to point out, have often done more harm than good. And this is not the first time I have had occasion to point out the crucial significance of printing in the history of Liturgy and - indeed - of Theology. Somebody Who Should Know told me that our beloved Holy Father is sometimes known among his Curial fellow-toilers as Ming the Merciless. The term suggests to me flickering black-and-white adventure movies from the 1930s, long fingernails, improbably droopy moustaches, unimaginable oriental cruelties, opium dens, and all that. Am I on the right lines? One simply cannot imagine Oriental Cruelties, or even Opium-fuelled Orgies, in Pope Francis' Rome. Incidentally, apparently the Holy Father, to show that he is not a luxuriating Renaissance Prince, is spending a humble and abstemious August in the Domus Sanctae Marthae. Does anyone know whether or not the air-conditioning (vide Laudato si Paragraph whatsit) is on? Is there any truth in the rumour that the cooler and papally-vacated Castelgandolfo has been made exclusively available to clerical bloggers and their wives? Bishop, however, exaggerates when he talks about the cult of the Blessed Sacrament as absent through the whole middle ages. The thirteenth century shows a dawning awareness of something more profound. A 1260 ordinarium from Zurich finds it necessary to explain that it is "contrary to reason ... altogether absurd" that "the Eucharist, which is the true living Body of Christ, should represent his dead Body". In the same century a conventual ordinal preserved in Dublin ordered the Sacrament to be "honourably reserved for the use of the sick", but less than a century later another hand feels it necessary to add to the manuscript "and for the devotion of the choir". Once you stop thinking of the Sacrament Reserved as the real but dead Body of Christ which the Faithful need to receive when sick or dying, and begin to see it as the living Body of the living Christ, you will see it not as a supremely potent but dead relic but as the locus for a direct, lived, relationship between believer and Lord. We see this transition in the development of some of the very rare, early, processions of the Host before the end of the thirteenth century. The host was processed together with the other most potent relics of the Church concerned. But, over the next fifty years, such practices became much less common, and eventually disappeared. And this revolution led to a change in the vessels used for Reservation. No longer were they made of ivory, but of precious metals. No longer were they designed to represent the Sepulchre at Jerusalem. Above all, no longer was the Sacrament to be reserved in the same vessel as the Holy Oils*. One more piece should conclude what I want to say about this topic. *In the first millennium - remarkably, to our minds - the vessel blessed to be a container for the Sacrament was often called the Chrismale! "It must be allowed that during the whole middle ages ... the Blessed Sacrament reserved was commonly treated with a kind of indifference which at present would be considered to be of the nature of 'irreverence', I will not say indignity." Thus wrote that Prince of Liturgists, the lay Roman Catholic Edmund Bishop. Dix, also, observed that, in the first millennium, he could recall no instance recorded of a Christian praying in the conscious awareness of the Sacrament Reserved. I propose to devote one post to explaing why that is; and another to looking at the 'Eucharistic Revolution' of the fourteenth century. Note that the thinking here is entirely of the Body of Christ as His dead Body (an idea found in a rather different form in Byzantium; and known to some seventeenth century Anglican divines). And surviving artefacts make it clear that such vessels were constructed in the shape of a tower in order to resemble what the Sepulchre of Christ in Jerusalem was believed to look like. Perhaps the practice in some places of reserving the Sacrament underneath the altar-tomb implied the same idea. Such an understanding could easily assimilate the Sacrament to the status of a Relic. Thus an Anglo-Saxon Council of 816 even reassures the faithful that, if a church is not fortunate enough to have relics, the Reserved Sacrament will be good enough on its own! ... I get more and more mystified by news items wafting across the Herring Pond and centring on allegations that Brother Russky did something underhand to help one Donald Trump to win some recent North American election. Ever since WW2, various American agencies have been engaging in attempted or actual regime change in countries generously scattered all over the known world. They have not always, in so doing, managed entirely to avoid the termination of inconvenient lives. They seem quite unfazed by suggestions that they often leave 'liberated' countries in a far worse state than they found them. Then there are American-based corporations with fabulous wealth which 'charitably' spend money and bully UN and NGO bodies to attack the structures of the family world-wide, and to disseminate the Culture of Death. It is really quite stunning to hear so many in the Land of the Free, especially those tied to the apron-strings of that gruesome international abortionist Hillary Clintonova, suddenly discovering that they have such principled objections to anybody else on this planet influencing the political processes or moral systems of other countries. I can think of worse things than a world in which the leaders respectively of Russkiland and of Yankiedoodleland had a cosy relationship. If Donald Fyodorovich Trump really is hand-in-hand with Vladimir Vladimirovich, that's fine by me. If they can get together to dismantle some of their murderously vile weapons and use their combined influence to make the world a chummier place, so much the better. If they could collaborate in building, by the thousand, in continent after continent, superb churches for the Eucharistic Liturgy, the blessed Epiphany of God upon Earth, and in supporting the structures of the Traditional Family throughout humankind, best of all. That's what I would say if I were on the Grand Jury. August 6; the Transfiguration; an oriental feast brought into the Roman Calendar by Calixtus III in 1457 to commemorate the defeat of the Turks at the Battle of Belgrade in 1457 (rather as the Feast of the Holy Rosary commemorates the Battle of Lepanto ... whatever would we do without all those defeats of the Turks?). Late Medieval England developed a great devotion to the Holy Name of Jesus, especially with the encouragement of the Lady Margaret, mother of Henry VII. So here in England, the following day became the Feast of the Holy Name. A good idea, in my view. Just as Corpus Christi needed to be extracted from Maundy Thursday and given the opportunity to be celebrated at a time not preoccupied with the progress of Triduum (call it duplication if you like), so the Holy Name can do with being extracted from the Christmas/Circumcision/Naming sequence and given space to stand alone. What a shame the Ordinariate Calendar missed this opportunity. Actually, if you follow the Novus books, you could say a votive Mass and Office of the Holy Name on August 7. What went under, what got lost in all this, was poor old Xystus. One of the martyr-popes in the Canon Romanus; the Pontiff whose own martyrdom preceded that of his own Archdeacon, S Lawrence, a few days later. The story is a poignant one: the arrest of the pontiff while preaching from his cathedra; his leading away to 'sacrifice to the gods'; his refusal. He was then brought back to be martyred at his own altar, together with two of his deacons; as he was being prepared for death, Archdeacon Lawrence said "Why do you abandon me, Father, you who never offer the Holy Sacrifice without your deacon?" "You will follow me in three days", said S Xystus. S Lawrence is one of three great patrons of the Roman Church; Septuagesima, Sexagesima, and Quinquagesima being dedicated, as their liturgical propers demonstrate, to SS Lawrence, Paul, and Peter. Celebrating S Xystus on the 6th and S Lawrence on the 10th is both elegant and moving. But, in the Novus Ordo, you can't. The novel fad for confining one day to one theme, unknown to the classical Roman and Byzantine rites, led the reformers to move S Xystus back off the Transfiguration (on the 6th) to the 5th and then to change their minds and move him to the 7th. I can only say that I consider this a great shame. What on earth is wrong with the old custom of keeping the Transfiguration on the 6th with a commemoration of S Xystus? He's much more likely to be noticed there than as an optional memorial competing for attention ... and on the wrong day. Somebody sent me a link to a picture apparently showing the "General" of the "Society of Jesus" in a Buddhist posture praying, it appeared, among Buddhists towards a Buddha. Of course, photographs do not always tell the whole story, and there may be circumstances of which I am not aware. And it will undoubtedly be true that if the "principles" of Amoris laetitia really do cover Adultery, as so many of our Holy Father's admirers claim, then they will clearly also cover Idolatry (together with Genocide, Paedophilia, Embezzlement, Torture, and all the other Family Entertainments for a Cold Winter Evening so conveniently listed in Gaudium et Spes 27 and carefully repeated at Veritatis splendor 80). Apostasy? Clerical Apostasy? Public Clerical Idolatry?
" ... What could they have said? To have surrendered the scriptures and the sacred vessels was 'apostasy', still for clerics (though not for laymen) the irremissible sin for which there was no possible penance. And they knew it; Felix [the City Warden] knew it; even the grinning public slaves knew it. They had saved their lives - but they had all irremediably forfeited their orders in that quarter of an hour. I know no more moving picture of the inner meaning of the persecutions than that shamefaced helpless group of apostate African clergy with the uncouth Berber names - the men who were not martyrs - as the public slave saw them across the shoulders of their enemies and jotted down their actions on that hot May afternoon sixteen centuries ago." I believe the most recent very senior cleric to be caught apparently committing Idolatry 'to camera' was Maradiaga. It is claimed, I do not know upon what evidence, that there is another cardinal who once offered flowers to the deities in a Hindu temple. Pretty certainly misreported nonsense, but the sort of misreported nonsense that can be unsettling for us simple and unsophisticated souls. I wonder whether we are bound to regard those against whom there is very plausible and undenied prima facie evidence of Idolatry as still morally entitled to the exercise of their Orders (of course, the character of the Sacrament of Holy Order will certainly not have been expunged from their souls ... the Church's Rigid Dogma makes that clear). Will the student clergy in the Roman Colleges be obliged to concelebrate with highly-placed apostates? Would it be a helpful service if the Annuario Pontificio published the names of those hierarchs who had committed Idolatry, making clear, perhaps, which of them had been subsequently absolved for the Sin, and which (on the grounds that "their consciences were comfortable with it") had not? As our dear old British journal of public record, Private Eye, likes to say, I think we should be told. His Eminence Gerhard Cardinal Mueller may not have been well treated by the current occupant of the Roman See ... but he was badly treated by the more eccentric wing of Traddidom long before that. Among the things I most admire about Mueller is his steadfast defence of the highly important principle, established by Benedict XVI and detested by the apostate sections of Germanic Christianity, that Episcopal Conferences have no theological status. The Universal Church, within which the Roman See is the centre of Catholic Communion, does have status; and so does the the Local, Particular Church, with its Bishop, Presbyterium, Diaconate and Laos. But 'Conferences' ... no way. Lose sight of this, and you will find yourself wandering down the muddy track called Provincial Autonomy, which smashed up the unity and traditions of the once great Anglican Communion. The Universal Church does indeed have priority over the Particular Church, as Ratzinger demonstrated in his punctiliously courteous but devastating demolitions of the sneering and nasty Kasper. The scholarly clarity of the former was more than a match for the slippery and phony logic of the latter. But the dafter traddies never really noticed any of this. It was Mueller's stand on Amoris laetitia which most irritated them. They totally failed to observe the dilemma upon the stiletto-sharp horns of which he skewered Amoris laetitia. His Eminence offered AL two alternatives: (1) it has changed nothing; Familiaris consortio and Caritatis sacramentum still rule, OK; or (2) it has changed the immemorial praxis and doctrine of the Church. The former of these is the only viable option. It is widely suspected both by the pope's admirers and his critics that Pope Francis had hoped to create a massive and confused muddy area of ambiguities in which the solutions he wanted would bubble up to the service and gradually, over time, establish themselves as facts upon the ground. If that is accurate, Mueller called his bluff. Perhaps that is why he had to go. Gerhard Mueller will now have the leisure to work on his major edition of Joseph Ratzinger's works; and, I hope, to do a lot of his own work. He is, for a cardinal, young, and has much to offer the Church ... for which reason I am particularly glad that he did not accept some face-saving but time-wasting 'role'. If this pontificate lasts long enough, Bergoglio may come to regret that he did not (as the English mingently express it) keep Mueller inside the tent. Mueller has put up with major humiliations, such as the tediously insistent implication in Pope Francis' words that Kasper, and then Schoenborn, are this age's brilliant theologians. There are also compelling reasons for thinking that the more minor and private humiliations which Mueller endured, Friday after Friday, may not have been few in number. This kindly and intelligent man has served the People of God through all of that with grace, simplicity, and loyalty. I particularly hope that he will have time to return to the question of Liberation Theology. Despite a fair bit of froth about the Poor and the Peripheries, Pope Francis has no interest in this. But the major problems of unequal distribution and of the multinational corporations are still with us. So are the consequent violent polarities (as we see today in Venezuela) and the concomitant theological questions. Mueller is the man to take a fresh look at them. There appears to be a consensus that there is no evidence for the Our Father being in the Mass anywhere in Christendom before about 350. Before that, it was a non-liturgical prayer used, perhaps several times a day, either privately or among groups of the Faithful. And the evidence is that during this period, when Christians shared the Our Father, they concluded it with a kiss of peace. The earliest evidence I know for this is in Tertullian (c160-225; see de Oratione PL 1 1176-9). A custom had grown up of people omitting the Peace after the Our Father when they had been fasting. Tertullian disapproves of it because it includes an inclination to boast publicly about fasting, contrary to Matth 6:16. He calls the kiss the signaculum orationis; the sealing (as a document might be sealed) or finishing-off of the prayer. Rhetorically, he asks: 'What prayer is complete when the holy kiss has been torn from it? Whom does the Peace impede as he is doing his duty towards the Lord? What sort of sacrifice is it, from which people go away without the Peace?' And a couple of paragraphs earlier, speaking about the ending of the prayer, he uses the phrase assignata oratione; 'when the prayer has been sealed'. Similarly, Origen (c185-254) , commenting on the Kiss of Peace referred to by S Paul in Romans 16 and elsewhere, describes it as happening 'after the prayers' (PG 14 1282). Since S Paul never specifies where the kiss is to be given, Origen's 'after the prayers' presumably reflects the usage of his own time. It seems highly likely that what happened is this. When the Our Father was introduced into the Mass, it brought with it its concluding signaculum, the Kiss of Peace. Thus the Pax in the Liturgy is not, in itself, a reconciliatory preparation for Communion, but a 'signing off' from the Our Father and the Eucharistic Prayer. We find this situation reflected in the Letter of Pope S Innocent I to the Bishop of Gubbio in 416 (PL 56 515). Troublemakers in Gubbio had been saying that it was better to follow the custom of another Church as to the position of the Peace rather than that of Rome; the Pope responds ' the Pax has to be done after all the things which I'm not allowed to mention to show that the people have given their consent to everything which is done in the mysteries and celebrated in Church, and to demonstrate that they are finished by the signaculum of the concluding Pax'. The fact that he employs the very term signaculum which had been used by Tertullian suggests that we are dealing with conventional usage widespread enough to be common to Rome and North Africa and over a period of at least two centuries. Thus the Roman position of the Peace appears to have a meaning and logic which go even beyond the introduction of the Our Father into the Mass, back to those early days when Christians met in little groups to say the Lord's Prayer together. That logic was the communal and corporate assent of God's People to the Lord's own Prayer. Of course, this does not exclude the notion of the Peace as a gesture of reconciliation among those who, as one Body, are just about to receive in the Eucharist the one Body and the one Cup of the Blood of the Redeemer. That theme is itself suggested by the last few clauses of the prayer, concerning mutual forgiveness. But I wonder if there is a slightly different alternative narrative which might be valid here. Might the passage I have quoted from Tertullian relate not to the extraliturgical use of the Lord's Prayer among Christians, but to its use within the Mass? He does seem to be talking about something more corporate than merely a semiprivate prayergroup. And note the phrase 'What sort of sacrifice ...?' And there is a paragraph nearby where he criticises the habit of sitting down after the Peace; if the Peace simply concludes a little prayer meeting, why should the participants not be allowed to sit down once it was over? Another And ... Having criticised his fellow Christians for witholding the Kiss so as publicly to flaunt the fact that they had been fasting, he goes on ' ... on the day of the Pasch, on which there is a rule of fasting which is common to all and as it were public, we rightly drop the kiss, because we don't care about hiding the thing [i.e. fasting] which we are doing with everybody else'. Those familiar with the traditional Roman Rite will recall that, to this day, we do not exchange the Sign of Peace at the Good Friday Mass of the Presanctified, nor at the Mass of the Easter Vigil (even though the celebrant has said the words). This is because we are all deemed to have been fasting. Questions arise: if the Our Father was within the Mass as early as the time of Tertullian, what does this do to our understanding of the early history of the Liturgy? How are we to fit in the apparently second century evidence for the Peace coming at an earlier point in the Mass? Why should those fasting consider it appropriate to withold the Kiss? What is the relevance of all this to the Eucharistic Fast, first witnessed in North Africa at the end of the fourth century? And does the evidence we have considered derive support from Dom Gregory Dix's compelling theory about the Mass of the Presanctified (i.e., that the third century practice of Christians communicating themselves privately on weekdays from the Host which they had reserved at the Sunday Mass, and blessing by the recitation of the Lord's Prayer and then drinking a cup of wine as an 'antitype' of the Blood of Christ, is found as the Communion Rite of the traditional Roman Good Friday liturgy, simply transferred from the private to the communal context)? I never cease to be surprised at what I find whenever I delve back into the history of the venerable and wonderful Roman Rite. It was because of rumours that the current papal regime might reverse Summorum pontificum that I wrote my recent series on Concelebration in the Roman Colleges. I suppose I must learn that people don't read all one writes and commonly fail to grasp what one is really getting at. I will put my opinions as simply as I can. I do not think it is the Holy Father's style to do things in an unnecessarily and publicly confrontational way. There are certainly gruesome individuals around like Andrea Grillo who do hope for SP to be eviscerated. This, they hope, would be achieved by eliminating the Subsidiarity according to which all presbyters can celebrate the EF without needing permissions. But I do not think that the HF would just reverse SP, certainly not during the lifetime of his predecessor. I think the current pope prefers to achieve his ends by more subtle and round-about means. I suspect the draft Working Paper which I discussed at such length, of being an attempt by Pope Bergoglio or, more likely, his intimates such as the Prefect of the Congregation for Clergy, to destroy the priestly culture that SP fed into. That's much more his style. Anyway, Benedict XVI, not the stupidest of men, got in first by making clear that it would be ultra vires for any pope to attempt to extinguish the classical Roman Rite. 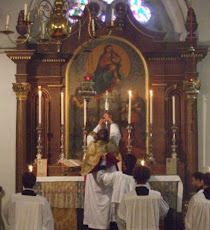 Remember also that it is historically the position of the SSPX that they did not ask for permission to celebrate the older Rite themselves in a private ghetto, but insisted, absolutely rightly, on this fundamental liberty, never lawfully abrogated, being confirmed to every presbyter of the Latin Churches. Pace Bishop Williamson's mistrust of his former colleagues, I do not think the Society would renege upon such a highly important principle. At Padstow in Cornwall, two hobby-horses dance their way through the town each May Day. In the 1930s some daft people called the Folk-Lore Society persuaded themselves that this was a relic of a pagan sacred marriage between Earth and Sky. (Hutton gives a witty and hilarious account of the antics there of one of these nutters, called Violet Alford, who was very angry that the locals failed to realise the massive cultural significance of male transvestites.) The town council cheerfully assured prospective tourists that it was a Celtic custom 4,000 years old ... well, they would, wouldn't they? But modern scholarship, Hutton demonstrates, shows that there is no evidence for the custom going back beyond the late eighteenth century and very good reasons for being confident that it did not. At the beginning of August, in many parts of Ireland, the country people climbed mountains and indulged in bonfires and jollity in honour of the God Lugh ... or did they? Hutton ... spoil sport ... gives good reasons for doubting whether these customs really have anything at all to do with the 'Celtic' god Lugh. They celebrated the opening of the cereal or potato harvest. And, as such, they were broadly parallel with the Anglo-Saxon celebration of 'hlaef-mass', loafmass, Lammas. It was the custom to reap the first of the ripe cereals and bake them into bread which was blessed in church upon that day; quaint things were sometimes then done to it to make the barns into safe repositories for the grain about to arrive in them. Hutton leaves it an open question whether there is any link beteween the Lammas ceremonies and those of Lughnasa. But he does see both as "a reminder of the excitement which once attended the ripening of the corn across the ancient British Isles" (what my Irish readers call "the Atlantic Archipelago"). The popular play 'Dancing at Lughnasa' constituted a particularly nasty, more modern, example of the manipulation of any silly old heathen superstitions that can be dragged along to rubbish or ridicule the Catholic Faith ... a potent cultural icon, in effect, of post-Catholic Ireland and its sad vacuity.